I'm still really enjoying the Beautiful You stamp set (also available in Clear Mount) which is amazing considering I didn't like it at first! I think Beautiful You is set to be one of the Stampin' Up! 2017 favourites. The more I saw customers and Demonstrators using it the more I liked it. 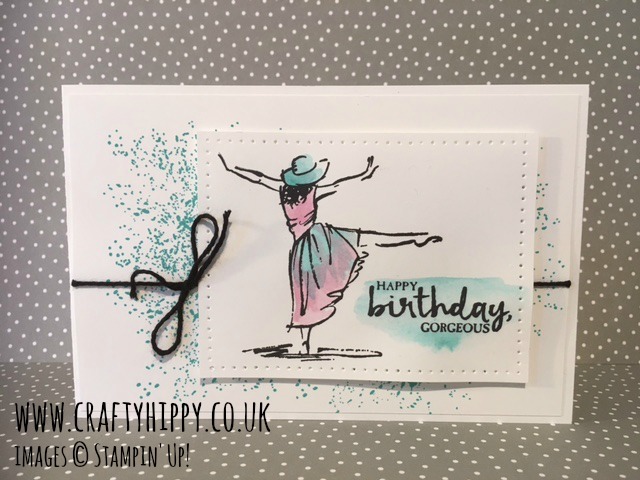 I have used two colours in this card - Emerald Envy and Sweet Sugarplum. I blended the colours on the dress and hat using an Aqua Painter. The speckles in the background are from Touches of Texture (also available in Clear Mount). I finished off my project with some Basic Black Solid Baker's Twine. How to shop Stampin' Up! Either click on the highlighted names of products or use the Shop Now button at the top of this page. You'll be taken through to our secure online shop where you can browse and buy Stampin' Up! products every day of the year. I'll be back tomorrow with another project, thank you for stopping by!